I traded for some meteorites a while back thinking that I would use some of the material in my knives. However, like the dog that caught the car, I now don't know what to do with them. My designs don't lend themselves to much embellishment, and my tooling would turn 40-50% of the precious material into dust. I thought I'd offer them here. Value is very subjective. They were priced at $499 and $116 respectively. I traded off $450 in knives for them in a package deal (at retail price). I will entertain any offers. Provenance and displays are included. Was wondering just how did you plan to use them for a knife Mr. Garrett? A forge somehow into damascus? Or just make into the guard/hilt/pommel/bolsters etc? 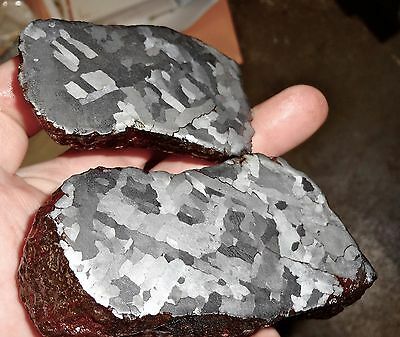 These meteorites are from a large event and are not particularly rare. They fetch forty to fifty cents per gram in a fair market, though you'll find them far more expensive on ebay. The Sikhote-Alin meteorite was a witnessed fall which increases its value (among collectors, anyway). It was also the largest meteorite impact event in recorded history. There are two types: Individuals which landed intact during the event and explosive fragments from parts that detonated near the ground under heat stress. The one offered is an 'individual' and is more valuable as a result. Not many are sliced due to their value. Those that are, vary considerably in their crystalline patterns when etched. These are prized specimens and command $2 to $3 per gram. As I said, I'll entertain all offers. Thank you for the answer Mr. Garrett. Interesting. Can see why it could be profitable to include them into a knife. My intent was for bolsters, guards, etc., but I do very few of those. I may never use them. There is material for many knives depending how skillfully one can stretch it. Thanks for the offer Steve. You do fantastic work, but with a big move to Idaho on the horizon, I'm more interested in cash or those items which could be easily turned into cash, i.e., stabilized woods, Damascus billets, etc. I really would like that Campo del Cielo but can't do cash. I do have lots of stabilized wood, or I can make a couple of daggers, or even one nice damascus dagger.I have mother of pearl, blacklip mother of pearl and fresh water pink mother of pearl. Ah well if you don't get some cash, let e know and we can work something out.